The mahi mahi fish is one of the most attractive fish in the ocean with bright, iridescent colors. Also known as dorado or dolphinfish, mahi mahi are found in tropical and sub-tropical waters around the globe. Reaching swim speeds up to 50 miles per hour, mahi mahi are prized by game fishermen for their powerful acrobatics. They have lean meat with large, moist flakes that create a magnificent white fillet. Mahi mahi are an excellent source of lean protein. In many ways, mahi mahi is an ideal fish, combining a sweet, mild flavor with a firm, almost steak-like texture and lean protein and health benefits. This combination, or any element taken separately, is appealing to many different kinds of diners. It is not an oily fish, but tends to keep moisture well and holds up with most cooking methods, expanding the options it can create for a menu. Fillets can be grilled, fried, broiled or sautéed. The delicate flavor is well complimented with zesty sauces and toppings for a lovely dish for which diners will return to order. 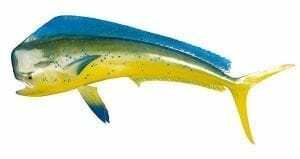 Mahi mahi fish grow and mature very quickly and are resilient to heavy fishing pressure. They are caught with longlines which causes some concern about incidental catch of sea turtles, seabirds, sharks, and marine mammals. However, well-managed fisheries use an array of measures to reduce this bycatch, making these fisheries more sustainable. Pucci Foods understands the value of providing quality seafood that is fresh, safe and sustainable. We are thrilled to support our oceans and bring excellent products to our customers. By purchasing your fresh seafood from us, you are helping to promote the sustainability that protects stocks and attracts customers. Order your wholesale mahi mahi from Pucci Foods today by filling out the form on this page and our team will be in touch right away.